When I last posted on the topic of evolution, I was challenged by commentator Mr. Timothy Mullgan to provide what was my own personal opinion of how the origin of man occurred on this earth. He also said he expected my question to not be "fundamentalism," which he later equated with literalism. Before I answer this, let me make a few points. First, understand that the question of how man came to be on this earth is separate from how long ago it happened. I am not going to deal at all with the age of the earth or how long man has been around, merely how I think he got here. Second, I would strenuously deny that literalism equals fundamentalism. No Catholic can ultimately say that we shouldn't take biblical texts literally - our faith is founded upon a very literal interpretation of many texts ("Thou art Peter, and upon this rock..." "This is My body"..."Whosever sins you forgive are forgiven..." "Unless you are born again by water and the spirit..."). We absolutely cannot rule out simple literalism as a way to intepret Scripture. Especially when, as the CCC and longstanding tradition maintain, all interpretations of Scripture rest upon the literal (CCC 116). When Catholics scoff at taking the Bible literally (and I'm not saying Mr. Mulligan does, but some people certainly do), what they are really saying is that there are some parts of the Bible that it is okay to take literally and other parts where it is not. I do not deny this is sometimes the case, but by and large I think the Bible is best taken literally in all its parts, if for no other reason than I would rather err in taking Genesis too literally than in not taking it literally enough. Some parts of Scripture certainly are allegorical - but where does Genesis fall? Is Genesis 1-3 to be taken literally or not? Among all the Scriptural texts about creation, the first three chapters of Genesis occupy a unique place. From a literary standpoint these texts may have had diverse sources. The inspired authors have placed them at the beginning of Scripture to express in their solemn language the truths of creation - its origin and its end in God, its order and goodness, the vocation of man, and finally the drama of sin and the hope of salvation. Read in the light of Christ, within the unity of Sacred Scripture and in the living Tradition of the Church, these texts remain the principal source for catechesis on the mysteries of the "beginning": creation, fall, and promise of salvation (CCC 289). Evolution can be said to have occurred with the material from which the human body comes, but it can by no means be taught as certain and must be put forth as only a theory (36). The human souls of Adam and Eve, and of all subsequent humans, are immediately created by God; the soul did not evolve (36). All human beings take their origin from an original pair or two human beings (Adam & Eve) and that Adam and Eve were real, historic individuals (37). Genesis 1-11, though containing metpahoric imagery, are nonetheless to be taken as historical accounts of true events (38). As you can see, the Church is making allowance that, under certain conditions, one can accept evolution. People today treat it as if it is the other way around, that there is an allowance to believe in immediate creation if you are ignorant and want to cling to how most people have always understood Genesis. John Paul II wrote some letter to scientists during his pontificate in which he speculated that evolution was "more than a theory," but a letter written to a certain academy doesn't hold the same weight as an encyclical, of course, so as far as I know, Humani Generis is the last binding declaration the Church has made on the matter, and that document says it is acceptable to believe in evolution, but only under certain conditions and by way of concession, not admission of its truth. Indeed, the tone of Humani Generis is very sceptical of the theory of evolution as a whole. So, how do I think it happened? Well, here is my belief. I think (of course) that the world was completed and finished prior to the arrival of man. When everything was ready, I imagine God forming a body out of the sand or mud, kind of like it would look if you were to bury yourself in sand at the beach. Then I think the sand-dirt form was sculpted until it looked perfect, just like a real man, kind of like a statue or perhaps the terra cotta men found in the tombs in China. Then, when it was perfectly formed, I think God breathed on it and the dust became flesh, life came into the nostrils of the man and he became alive. 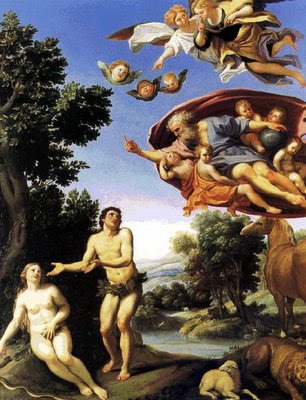 I think Adam was fully grown when he was created, and leapt up with a sudden realization of consciousness and self-awareness, to gaze about and behold the unfallen creation for the first time straight from the hand of God. What a sight it must have been! I believe he had an immediate awareness of God that was infused and an unhindered communication with Him. I think the whole process was very quick, perhaps but a few moments or several minutes (groundless speculation, of course). So, I guess you could say that I literally believe he was formed out of the dirt and given life. Again, I don't know how long ago this happened, but this is what I think it looked like. This is just my imagination, of course - who really knows what it "looked" like. So there you have it. I'm not going to spend a lot of time defending my imaginative vision of the creation, but I know that many saints and doctors have believed in an immediate creation of man. Some have speculated that each "day" of creation was 1,000 years, but I don't know of any who explicitly taught that man himself evolved over a long period of time. An interesting point regarding the age of things. If Adam was created full grown (as most theologians who believe in an immediate creation would agree to), then suppose that five minutes after he was created, a doctor walked up to him and took a look at him. Suppose I asked the doctor, "How old does this man look to you?" The doctor would look at Adam's full stature, his developed limbs and (possibly) facial hair, and taken altogether might say, "Thirty years old." Indeed, he would appear that old, and perhaps he would have the height and stature of a thirty year old man. Medical tests of his biological systems might even confirm that he was an extraordinarily healthy thirty year old man. But he would be only five minutes old. In the same way, the fact that light from a star supposedly takes billions of years to reach here or a certain strata of rock is supposed to be one hundred million years old doesn't concern me - if God created things complete, they would look complete. Light would be created in viae from the star, so that it doesn't necessarily need a billion years to get here. A star a billion light years away could have been created with its light already in course, so that it would have been visible to the first man the moment of his creation - mountains are created complete, so that if you were to ask how long it would take for the continents to push them up, well of course millions of years if they were created that way, unless they came forth from the hand of God immediately and completed to their smallest detail at the moment they were brought forth. This doesn't have to do with evolution, but the age of the earth, so I won't go much more into it. I just think it is interesting. Wherefore as by one man sin entered into this world, and by sin death; and so death passed upon all men, in whom all have sinned (Rom. 5:12, Douay). Now, let's say we adopt the theistic evolutionary point that the human body has evolved from preexisting material. That "material" presumably means other organic bodies that were born, grew up, and died. Evolution is all about slow change over time as things are born and die. But if evolution produced the first human body(which God then presumably 'ensouled'), doesn't it require that thousands upon thousands of previous sub-human beings were born and died to get to that stage? And if it was the sin of the first man that brought forth death, how could death have been present and active in the world before sin? And if death was already happening before the first man sinned, what was so different about man's punishment after the Fall? That he would die? If his body evolved from preexisting non-human bodies, then there would have already been death for thousands upon thousands of years, and Genesis and Romans clearly say that death came about originally through the sin of Adam. To put it simply, it is a truth of the faith that death entered the world through sin. Theistic evolution asserts that death entered the world prior to sin. Therefore, theistic evolution is not compatible with the faith. This is just my opinion. Disagree if you want to. I largely agree with you although I would not stake my life on your last conclusion, that death-prior-to-sin precludes evolution. I would argue that the death mentioned in Romans refers only to human death, not plant and animal death. Prior to ensoulment, man was bestial, not human, and subject to death. Post ensoulment, man was naturally immortal but became mortal because of sin. I'm not saying there are not problems with this view, as well, but I would not go so far as to say that death before sin necessarily contradicts the Faith. Creation awaits with eager expectation the revelation of the children of God; for creation was made subject to futility, not of its own accord but because of the one who subjected it, in hope that creation itself would be set free from slavery to corruption and share in the glorious freedom of the children of God. We know that all creation is groaning in labor pains even until now; and not only that, but we ourselves, who have the firstfruits of the Spirit, we also groan within ourselves as we wait for adoption, the redemption of our bodies.I do not know for sure, but I have a hunch that the "futility" of the world, which came "not of its own accord" (ie, God did not make it to be that way) happened as a result of the sin of man. Man sinned, death came to man, and because man is the head of creation, creation suffered the penalty as well. I have no problem believing that plants and insects did not die before the Fall - but it would not be "miraculous," it would just be preternatural. But I think that is irrelevant because, supposing theistic evolution to be true, the immediate precursors to an ensouled man would not be insects or plants but very highly developed hominid creatures - I believe that prior to the Fall there was no death certainly among the higher animals and that there was no eating of flesh either. Like you said, I wouldn't stake everything on these arguments, but they are interesting. As it happens, I'm just finishing up a booklet on creation and evolution from a Catholic perspective. For God to create man so that he looked thirty-years old is one thing; after all, having (really or apparently) aged cells may be part of being an adult man. But for God to create fossils and other such things which are nothing other than remnants of previously existing things would seem to be creating a false history. The same thing with the light from a supernova. According to the theory of a young universe, God created light that has every appearance of coming from a star, though that star doesn't exist, and never did exist! Both as regards the age of the universe, and the age of the earth, non-Christians can conclude with certainty to a much older age, as well as to common descent of life. Cardinal Schönborn in a recent lecture thus affirmed, "The idea of the creation of complete individual beings or species is absurd. It is as untenable as the creationist thesis of a creation of the world in six 24-hour days, as the pseudo-scientific speculations about a 'young' earth, about a historical interpretation of the Flood, etc." (Original lecture [in German]). I've translated part of the lecture here. It seems to me, therefore, to be scandalous to propose a young earth, or to universally deny common descent of living beings, as being the meaning of Scriptures. I also think there are solid textual reasons to understand the literal meaning of the days in Genesis not to describe a temporal and historical order, but something like the order of matter to form, as Augustine describes. Wow! I hope you will let us know when the booklet is done. I am not including fossilized remnants of living creatures in the scheme of things that may look older than they are, only non-living natural things: mountains, stars, sediment, etc. I agree that it would be a bit untruthful and deceptive for God to stick fossils in the ground of creatures that never existed. But I think the circumstance is different with a star. I propose the star really does exist a billion light years away (of course), that it was created with all its light shining and a steady stream from it to here already in place at the time of its creation. The star is real. The light it real. The difference is that it was created the way we see it now - otherwise, if the light takes billions of years to get here, we'd have to posit that the star would not have been visible for billions of years and then suddenly appeared when the first light got here. There is nothing wrong with such an approach, but it is not the one I hold to. The idea of the creation of complete individual beings or species is absurd.I think this is a little reckless of him. First, though you are right that there are divergent opinions on Genesis, you cannot deny that many many eminent saints and doctors did indeed believe in exactly what the Cardinal says is absurd, and I don't think the nature of the question changes with the development of technology.I don't see why a literal 6-day creation is "untenable." Concerning the Historical Character of the First Three Chapters of Genesis [June 30, 1909] 4). Question: In the designation and distinction of the six days mentioned in the first chapter of Genesis may the word yom (day) be taken either in the literal sense for the natural day or in an applied sense for a certain space of time, and may this question be the subject of free discussion among exegetes?" Answer: Affirmative(Concerning the Historical Character of the First Three Chapters of Genesis [June 30, 1909] 4-8). 8).The PBC at this time enjoyed the highest level of authority and I would say that the Cardinal's statement that a six day creation is untenable is an irresponsible one at best and an ignorant one at worst. The literal six-day view has been and currently is permitted and has been historically dominant. Many Fathers believed in a literal like St. Basil, and others, like St. Augustine, asserted a young earth. "If anyone does not confess that the world and all things which are contained in it, both spiritual and material, as regards their whole substance, have been produced by God from nothing, let him be anathema" (Canons on God the Creator of All Things, canon 5). Vatican I seems to be saying that all creatures, even in their materiality, were created in their "whole substance" from God immediately ("from nothing"). This seems to rule out any idea of God creating the material aspect of man and then, at some later point, infusing the spiritual element directly.I may be wrong, but it seems to be the case. Keep in mind that I make no claim of how young or old the earth truly is - I don't know, and it is not the purpose of this post. I include the tidbit about the earth's age as way of demonstrating that I am least open to believing that it is younger than 4 billion years old. So, while I agree that theistic evolution is possible, as Humani Generis says, I assert that it is more in line with the way the Church has always believed to assert simple literal six-day creationism, without committing oneself to any position on the age of the earth. Boniface, thank you for explaining how you see the creation of man. I believe that your understanding comes from your heart, as well as your mind. There is nothing wrong with that; I do not think that your view conflicts with Catholic faith. Therefore, I do not wish to argue with you. I was simply and genuinely curious about how a Catholic who rejects evolution imagines the creation of man. Cardinal Schönborn's statement of course was of course made in Austria, not in the US (where ID and 6-day creationism is put forward much more vigorously than in Europe), and made to scientists. I linked it with St. Augustine's statement because it seems that in the Cardinal's opinion, as in my own, these are examples of things which, in St. Augustine's words, can be known "with the greatest certainty" by unbelievers. If one supposes that they are right, and that it is a matter of the "greatest certainty" that all the basic species were not created simultaneously or in six 24-hour days, then on the basis of St. Augustine's principle, it is no longer an open option to interpret the Scriptures that way. Thanks for the follow up. I wouldn't hold my views as central to Scripture or to theology...as I said, it is a matter of speculation and I wouldn't be willing to go to the block for them. However, I do think they are more consonant with tradition, whatever the Cardinal may be saying now. But I am curiosu, what do you make of the argument about "death before sin"? Do you hold that there was rampant and widespread death before sin, and that mankind alone was exempt before the Fall, or is Scripture to be taken literally here, that before the first sin there was no death absolutely? Thanks for taking the time to reply - I know you must be busy. As I understand it, Scripture is to be taken literally and death for plants and animals was natural and occurred before sin. St. Paul says "death" came through sin. But "death" is neither some abstract concept, nor some subtle substance. Death is always the death of something. So what death is St. Paul talking about here? The entire context seems to indicate human death. He goes on to speak of those (humans) who receive life through Jesus Christ. So it seems to me the obvious literal sense of this text refers to human death. It is not entirely clear what creation being subject to futility not "of its own accord" or "of its own will" means, but to say it means God didn't make it so doesn't strike me as very likely on the face of it. To subject creation to futility unwillingly would in fact seem to pertain to the one with the power over creation, namely God. I agree that there are no animals in heaven...the rest of the stuff is just speculation. I always just thought the falleness ("futility") of the current world was bound up with the fallen state of man and, implicitly, before death reigned in man it didn't reign in the world either. Vegetarianism seems to be more of a disciplinary issue than something intimately tied to the Fall. Keep in mind, it was not revoked at the Fall but only after the Flood, many centuries later. Vegetarianism seems to be favoured because it does not involve bloodshed and the consumption of blood. Even after the Flood, the prohibition against the consumption of blood remains. Vegetarianism and later, bloodless meat, has nothing to do with death per se. There seems to be the notion that the only "body and blood" we should be consuming is that of Our Lord, prefigured in the manna, and fulfilled in our churches. Many of the Fathers make this point, often referencing the Israelites in the desert who preferred the flesh of beasts to the bread of angels. I always just thought the falleness ("futility") of the current world was bound up with the fallen state of man and, implicitly, before death reigned in man it didn't reign in the world either.I think I can fill in some gaps related to death in the world as well as creation before and after the fall. Like you, I'm not even pretending certainty. Before man, creation was a largely self-regulating system. Even if one animal died, creation itself was fruitful. It had a purpose, namely to create a body for man. Creation achieved its purpose, and life was good in Eden. But man fell, and this made a mockery of that purpose. Creation is now futile the same way a lawnmower with a broken blade is futile. If life for creation means a self-sustaining cycle towards a purpose, then the death that man brings is the environmental destruction that you hear so much about. You can go through the seven deadly sins and check off how each leads us to poison our home. Creation awaits with eager expectation the revelation of the children of God; for creation was made subject to futility, not of its own accord but because of the one who subjected it, in hope that creation itself would be set free from slavery to corruption and share in the glorious freedom of the children of God.Other than being inelegant as far as describing what it means for God to make man from dust, can you see any problems? I think that is a very nice theory that I see nothing wrong with at all. However, I equally see nothing wrong with maintaining that nothing at all died in any way before the Fall. Your theory would only become necessary if we were bound to uphold biological evolution, which as I am not, I admit as one intriguing possibility while upholding my previous position as equally plausible. Thanks for taking the time to work through this! Perhaps one could say that this New and Full Man, from the beastly one before (without a soul and understand) was taken from the unprotected Creation, into the protected Creation, and having no understand of death earlier was also protected in Eden. But then they sinned, and this, death as we know it (not simply as animals) was a curse to us. What is God’s Finger Doing in My Pre-Biotic Soup?